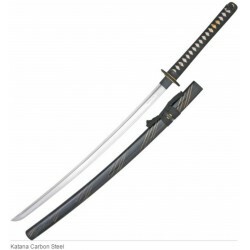 Misc Handmade Katana. 39 1/8" overall. 26 7/8" sharpened carbon steel blade with blood groove. Imitation rayskin handle with tan cord wrap. Sculpted cast metal tsuba and pommel. 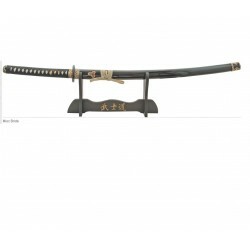 Black lacquer finish wood scabbard with removable dagger. Handmade in China. Samurai kard , tartóval, fa tokkal Bride's Sword - 39 1/8" overall. 26 1/2" sharpened stainless blade with simulated temper line. Imitation rayskin handle with black cord wrap. Black finish sculpted cast metal tsuba and pommel. 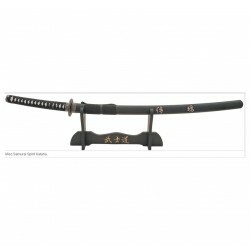 Black composition scabbard. Comes with display stand. 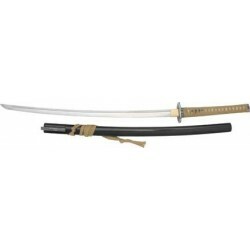 Samurai Spirit Katana - 38 7/8" overall. 26 1/4" sharpened stainless blade with simulated temper line. White imitation rayskin handle with black cord wrap. Black finish cast metal tsuba with dragon artwork. Black finish composition scabbard. Wood display stand.